A hand-held light meter is a small device that can accurately measure the light reflecting off or falling on the subject. 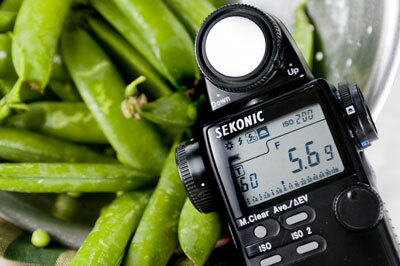 In food photography, using a hand-held meter when shooting foods can help you get properly exposed images. Some people are unfamiliar with or intimated by a hand-held meter. Well, it turns out, working with a hand-held light meter isn’t so scary after all. And if you need that precise level of accuracy for a food styling shoot, it can be a most important addition to your photo gear. Reflective metering measures the light reflected off your subject. Incident metering measures the light falling onto your subject. Spot metering (using reflected light) allows you to pinpoint very small areas in your subject to take exacting measurements. So why should you use a hand-held light meter? Even though most cameras generally have an onboard, through-the-lens light meter, a hand-held light meter is better. Provided you’re not shooting completely manually, the internal metering system takes an average of the light values reflected off the subject you’re shooting. In other words, it takes an averaged reflective reading, which is often okay but can provide difficulties when, say, shooting a dark-colored food subject on an all-white background or the like. The internal meter averages things out, and the results can be less than great, such as an unattractive cast to the image. For food, you might try using an incident meter. Incident metering refers to measuring the light falling onto your subject rather than the light reflecting off your subject. It works by using the little globelike photosphere at the top of the device, as shown in the following figure. A hand-held light meter measures light reflecting off and falling on a subject. After you enter your ISO/ASA into the device, you can start to meter the food subject. To measure the incident light, you place the meter right next to the subject. Measure the light falling onto your subject by facing the globe (actually a light-sensitive cell) away from the subject and toward your camera. Read the information from the light meter, adjust your settings, and voilà! A richer, more accurately exposed image is yours to enjoy. If you’re using strobe lighting (flash mode) you can connect the light meter to the strobe unit with a sync cord for handy access.